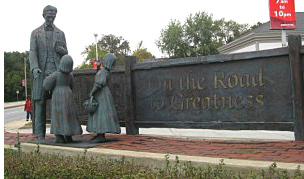 Northwest Indiana Times recently published a number of articles on the Lincoln Highway, including “Lincoln Highway, a lifeline for Illinois communities.” It includes mention of the sculpture seen at right, “Lincoln on the Road to Greatness,” which depicts Abraham Lincoln receiving flowers from two girls. The statue, dedicated in 2003, was funded by private donations including 200,000 pennies collected by local students. It is at the intersection of the Lincoln and Dixie highways, which on the opposite corner includes the Arche Memorial Fountain, dedicated decades ago to be a place of rest for weary motorists. An article at Inside SU, a news site for Syracuse University, relates the long and interesting story of a statue along the Lincoln Highway. That rendering of Abraham Lincoln along JFK Boulevard in Jersey City was created in 1930 by well-known sculptor James Earl Fraser; his “End of the Trail” portraying an exhausted Indian on a horse was at the time adjacent to the western terminus of the Lincoln Highway in San Francisco. Lincoln statue photo by Kyle Weaver, from Lincoln Highway Companion. The article also tells the tale of an identical bronze Lincoln in the courtyard outside Maxwell Hall at Syracuse and how the duplicate came to be. The 200th anniversary of Abraham Lincoln’s birth on February 12th has launched numerous events to honor the 16th president of the United States, 1861-65, Lincoln’s name was invoked almost 50 years after his death in naming the Lincoln Highway, and so the bicentennial brought about the marking of the Lincoln Highway’s eastern terminus. Below is the wreath laid at the Lincoln Memorial on his birthday by Harmon, reresenting the Lincoln Highway National Museum & Archives. Portrait credit: Brady National Photographic Art Gallery (Washington, D.C.), photographer. “Abraham Lincoln, three-quarter length portrait, standing, facing left.” 1864 January 8. Selected Civil War Photographs, 1861-1865, Library of Congress. LHA director for New York Jerry Peppers joined Mayor Michael R. Bloomberg and NYC Commissioner of Transportation Janette Sadik-Khan to unveil a Lincoln Highway street sign in Times Square yesterday, the bicentennial of Lincoln’s birth. It is said to be temporary or at least the first until a larger one can mark the spot as the Eastern Terminus of the coast-to-coast road. The Lincoln Highway brings together the ‘Main Street Across America’ and the nation’s most famous intersection — Broadway and 42nd Street. It’s particularly important to mark the eastern terminus of the Lincoln Highway, where it will serve as a reminder to millions of New Yorkers and visitors from all across the globe who pass through here of our nation’s history and the City’s connection with the rest of the country’s early highways. In the 95 years since the establishment of the Lincoln Highway, there has never been a sign or marker at the Eastern Terminus, unlike the Western Terminus which has had various signs over time. The Lincoln Highway’s identity was never strong in urban areas, where streets and street names were already entrenched. Craig Harmon, director of the Lincoln Highway Museum online site that participated in this week’s inaugural parade, announced his second annual Lincoln & Liberty Global Essay Contest. 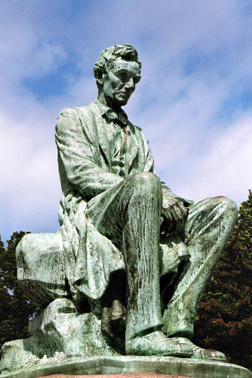 The 2009 contest happens to coincide with this year’s Lincoln Bicentennial Celebration. Categories for the contest include grade school (K-6), middle school (7-8); high school (9-12), college, middle age (age 18-59),and senior (60+). Deadline for essay entries is midnight February 9 with the winners announced on Abraham Lincoln’s birthday, Feb. 12, following the National Lincoln birthday celebration at the Lincoln Memorial in Washington, D.C. The grand prize winner’s name will be placed on a large Lincoln bust that will serve as a “rotating trophy.” First place winners will receive a commemorative Obama license plate made specially for the Inauguration and a certificate suitable for framing. Certificates will also be issued for second place, third place and honorable mention. Full contest rules and details are available at www.lincoln-highway-museum.org/ or directly here. Al Pfingstl, NJ LHA director, writes about an annual celebration at the Abraham Lincoln statue located along the Lincoln Highway in Jersey City, as seen in his photo below. This year is special in that it’s the 200th anniversary of Lincoln’s birth. The Lincoln Association of Jersey City is the oldest organization in the country dedicated to the memory, preservation, and understanding of Abraham Lincoln and what he stood for. Begun in 1865, it was formally founded in 1867, 2 years after the death of the President and provides a forum to present scholarship concerning the life, career, and legacy of the 16th President of the United States. The Lincoln Association of Jersey City strives to promote fellowship as well as scholarship in the spirit of Lincoln. On Thursday, February 12, 2009, at Noon at the statue of Lincoln at the entrance of Lincoln Park, Kennedy Boulevard, and Belmont Avenue in Jersey City, First Vice President Guy Catrillo will host the annual monument ceremony. Dr. Jules Ladenheim, a Past President of the Lincoln Association, will deliver one of President Lincoln’s memorable speeches. The ceremony will conclude with a placing of a wreath at the statue. At 5:30 PM, the Association will host the 144th Annual Dinner at the Casino in the Park, with a featured speaker to be announced. Cost of the dinner is $60 if you reserve a space or $70 at the door. To reserve a dinner spot or for more information contact info@thelincolnassociationofjerseycity.com/ or send a check with your name and the names of those attending, and your postal and e-mail addresses to the Secretary of the Lincoln Association, 9120 Columbia Ave., North Bergen NJ 07047. The Lincoln Museum, which has hosted an exhibit on the Lincoln Highway, will close June 30, 2008, after 80 years as a major resource for the study of Abraham Lincoln’s legacy. It is operated by Lincoln Financial Foundation, the charitable giving arm of Lincoln Financial Group. The foundation owns one of the most extensive collections of Abraham Lincoln-related items — 230,000 items valued at $20 million — including a copy of the Emancipation Proclamation and one of 13 Thirteenth Amendments signed by Abraham Lincoln. Also among the 79 artifacts are a cane he carried and his children’s toys. The collection also includes 350 documents signed by Lincoln, some 18,000 rare books and pamphlets., and 200,000 clippings. The museum cites declining attendance, averaging 40,000 per year, according to an article in The Journal Gazette of Fort Wayne. Priscilla Brown, vice president and chief brand officer for Lincoln Financial Group, said, in the paper’s words, that “the collection’s dispersal to other sites will better match the Lincoln Financial Foundation’s mission for the items, which is to ensure they get maximum exposure and remain accessible to the public…. The museum isn’t being closed as a cost-cutting measure and that it does not reflect any failure of the local museum staff.” The museum has about 20 staff members, most of whom will lose their jobs, and a “substantial” volunteer base. Fort Wayne has lost out. A huge historical resource is, for all practical purposes, gone. One expert told me [that] reactions have ranged from regret to anger to disappointment to shock to disbelief. The image above, from the museum’s web site, shows a re-creation of Lincoln’s White House office, where visitors can view personal artifacts belonging to Lincoln, official documents, a chair from the Lincoln White House, a Senate copy of the Thirteenth Amendment, a Leland Boker souvenir edition copy of the Emancipation Proclamation, and personal and official letters of President Lincoln. A second press release explains how Lincoln Financial plans to take a two-pronged approach to make its Lincoln Museum collection more accessible and visible in celebration of the Abraham Lincoln bicentennial in 2009.